Bambi Kino – The original early 60's Beatles Hamburg sound! Bambi Kino — guitarist Mark Rozzo (Maplewood, Champale), bassist Erik Paparazzi (ex Cat Power), guitarist Doug Gillard (ex Guided by Voices, Nada Surf), and drummer Ira Elliot (Nada Surf) — is named after the movie theatre that was the Beatles' first home in Hamburg's notorious Reeperbahn district. Their repertoire is culled from the Beatles' 1960-1962 set lists, based on recordings (in many cases bootlegs) as well as archival research, allowing the band to perform songs the early Beatles were known to have played but never recorded. It's not exactly a tribute: There's no role-playing or wigs or leather trousers. But each Bambi Kino show — typically three or four sets long, consisting of upwards of 80 songs a night, with an array of special guests and even the occasional burlesque performer — is an homage to what the Beatles made possible for all musicians everywhere. 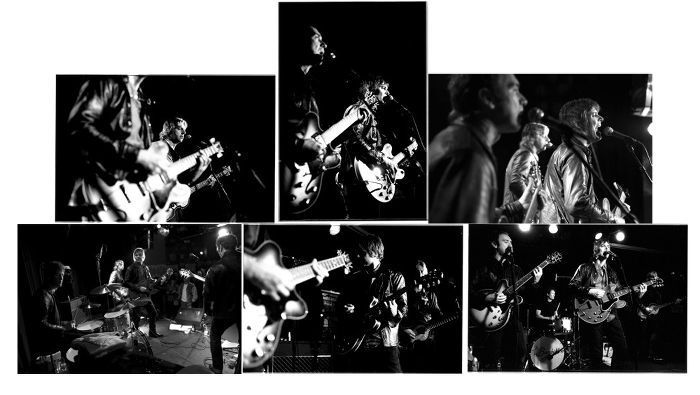 Since 2010, Bambi Kino done residencies at the Indra Club in Hamburg (where the Beatles began the first of their Hamburg visits in August of 1960), club shows in the US (New York, LA, Midwest), private events, and festivals. A debut single — "Some Other Guy," released in 2010 — was produced by Adam Schlesinger (Fountains of Wayne) and engineered by Eli Janney (Girls Against Boys), and a full-length LP — Bambi Kino, released in 2011 — was recorded on the stage of the Indra. Both are available from the Hamburg-based Tapete Records. Keep up with the latest Bambi Kino doings on Facebook and Twitter.